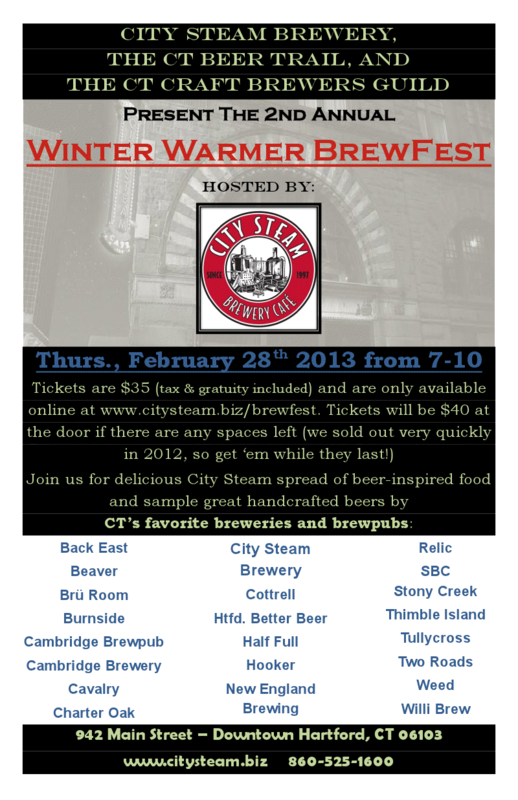 Coming up on Feb. 28 is the Second Annual Winter Warmer Brew Fest at City Steam Brewery and Cafe in Hartford, Conn.
Advance tickets for the 7-10 p.m. event are $35. Admission includes beer tastes from more than 20 local breweries, plus a cash bar and food from City Steam. You can get them by going to www.citysteam.biz/brewfest. If they don’t sell out, tickets will be $40 at the door. The sponsors are CT Beer Trail, City Steam, and the Connecticut Craft Brewers Guild. The Guild is a nonprofit organization that works to increase interest in Connecticut beer by finding ways to attract tourists and promote beer through festivals. If you have questions, call City Steam at (860) 525-1600. It’s located at 942 Main St., Hartford. Part of the proceeds from the event will go to the development of the CT Beer Trail destination map and other promotional materials. This entry was posted in Beer Snob and tagged brew fest, City Steam Brewing, CT Beer Trail. Bookmark the permalink.